During the EuroTier this week in Hannover, Germany the champions of the All-German competion were selected. At this competion all the Holsteins from Germany, Austria and Luxembourg could participate. 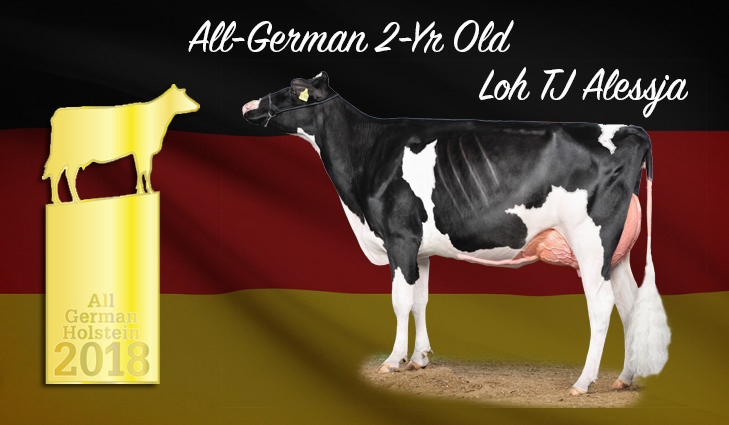 Loh TJ Alessja, the 2-Yr Old Champion of the Schau der Besten this year, was chosen as ALL-GERMAN 2-Yr Old! Alessja is owned by J. Lohmöller, T. Melbaum, M. Blais & Nosbisch Holsteins. She is an Armani grand daughter of Luck-E Advent Atlanta EX-94-USA. This family delivered many great show cows and the well-known RED show sires: Adonis-Red @ Semex and Awesome-Red @ ST. This years GRAND All-German was the famous Modest daughter Lady Gaga EX-97-DE owned by Henrik Wille & Friedrich Köster. She won the championship for the fourth time in a row! Congratulations to all the winners!